Good morning everyone. Hope you all are doing well this morning and ready for a quick and easy little project. Do you remember the old hobnail glass? You know that bumpy looking glass that was collected by our Mothers and Grandmothers. 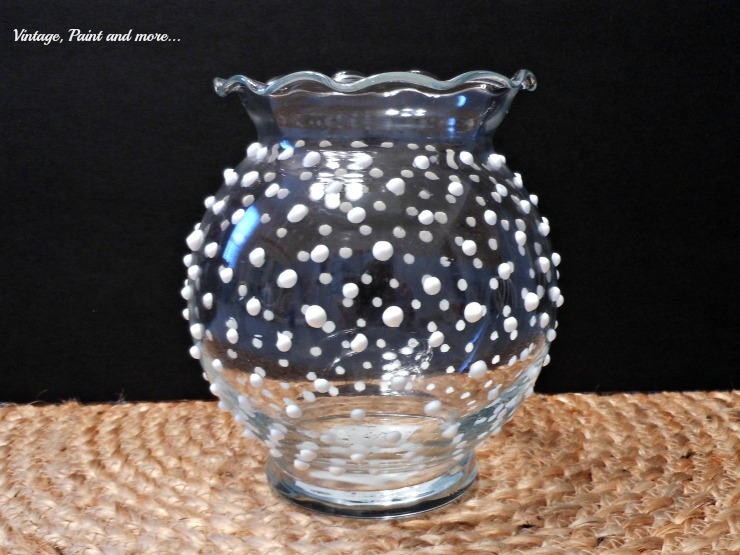 Then I proceeded to make my own hobnail glass. The fluted bowl on the left is the one that is the exact replica of my Mothers. I used some puffy white paint I have had for years and just put dots of it in rows around the bowl. I alternated the dots so that they did not line up in rows but looked more random. After it dried I painted it with some blue craft paint I had on hand. The dots definitely stand out with the paint. I think it looks pretty much like the real thing - what do you think? 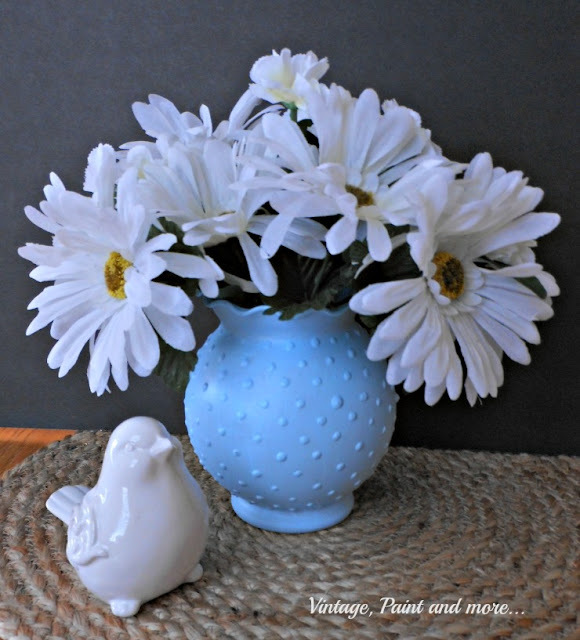 With some white daisies added to it - it makes for a very pretty little vase and brings back memories of my Mothers little vase. So delicate looking to me. 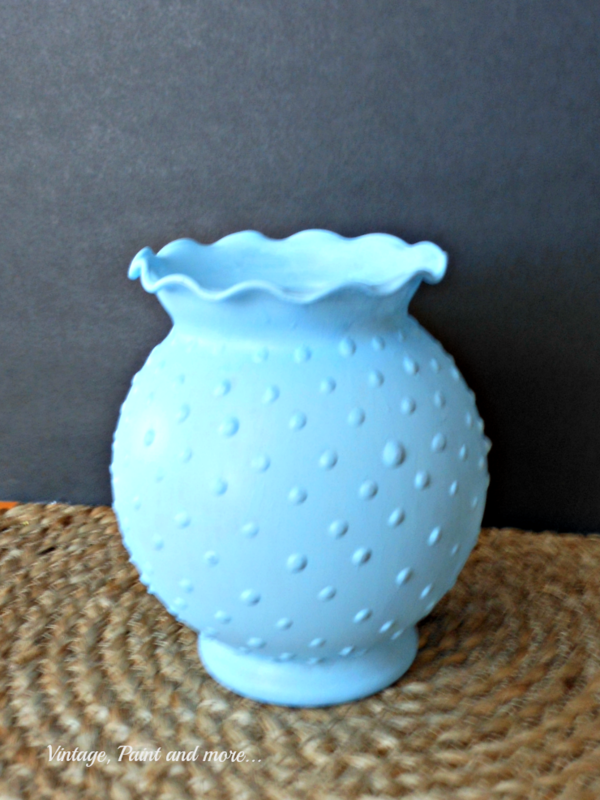 I love this blue hobnail glass so much and it's so simple to make that I am definitely thinking there will be a few more pieces added to my china cabinet. How about you - think you might try this? Hope you all had a wonderful Mother's day and was able to celebrate it with those you love. We were under a tropical storm with buckets of rain and some wind. Although it wasn't bad it did pour all day so we stayed in and enjoyed a Jesse Stone Marathon. I just love those movies. How was the weather where you are and what did you do? If you want to be sure you don't miss any of the projects I share be sure to sign up for my email in the Hello bar at the top of this post. I will be linking up to the parties listed on the Where I Party page. Please go and visit them. 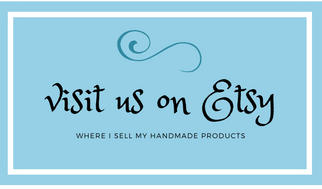 I think you'll love all the creativeness and great inspiration you'll find there. This is such a good idea! I love the color you used. I am totally going to do this to one of my glass vases! I never knew what the bumpy glass was called. Now I do! I think you did great. I wouldn't have guessed it wasn't real. Visiting from Party in Your PJs. Pinned this to my arts & crafts board. Gosh that turned out amazing!! Great job...and loving that color. That shade of blue is perfect! What a fun project! Such a pretty color of blue! Love it! Lovely! What a clever idea. I would have never thought of this. It looks great! 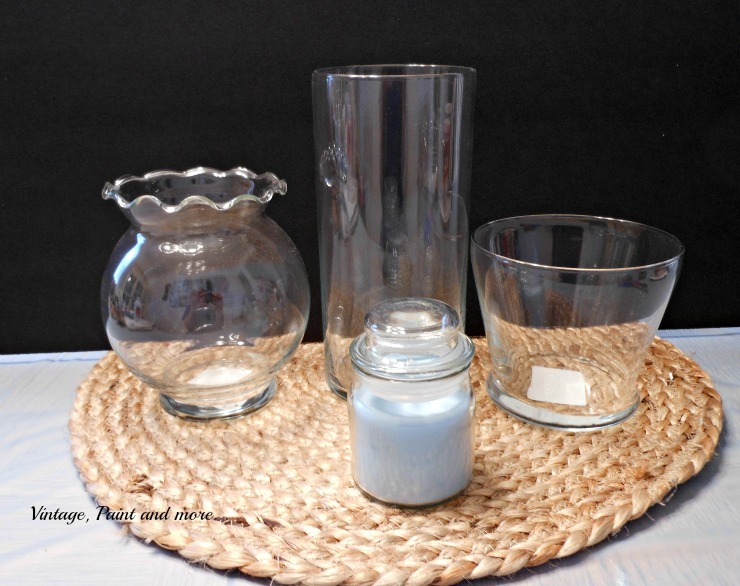 I collect milk glass and have several hob nail pieces. Now, I'm thinking I might make some faux ones to go with it. Wow Cathy, if I didn't know better I would think it was real hobnail. You did an amazing job! Love the blue color. I have a small collection of the white. Thanks for sharing with SYC. I will be featuring you this week. That blue is so pretty. Thanks for sharing this at the #HomeMattersParty. We hope to see you again next week. Isn't that so clever!! I just love how it turned out. 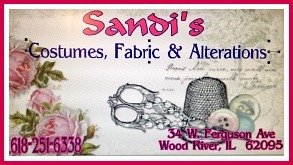 :) Thank you for swinging by Snickerdoodle Sunday and sharing your wonderful project!! Amazing!! What an amazing project!! Thanks so much for sharing and thanks for stopping by! This is brilliant. I have not seen this before. 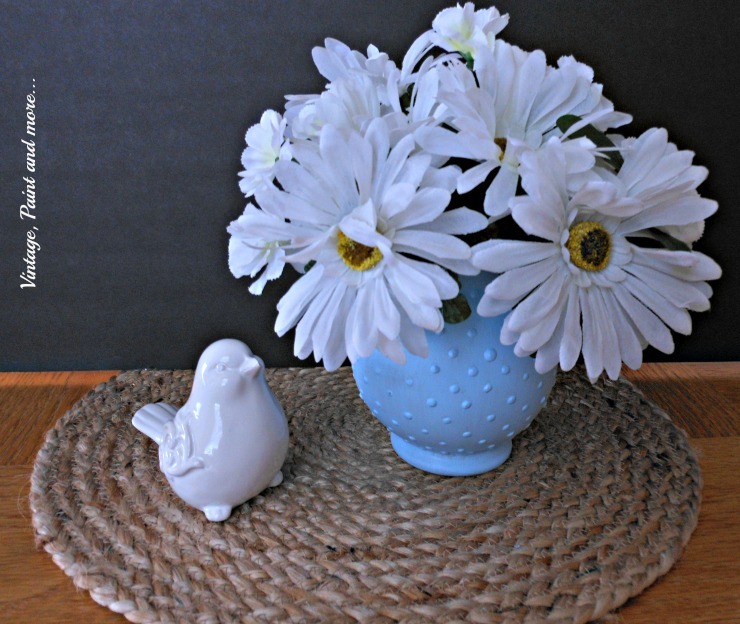 The daisies are the perfect flower for this sweet little vase. Love it! Visiting from SYC Happy Thursday! Hi Cathy! 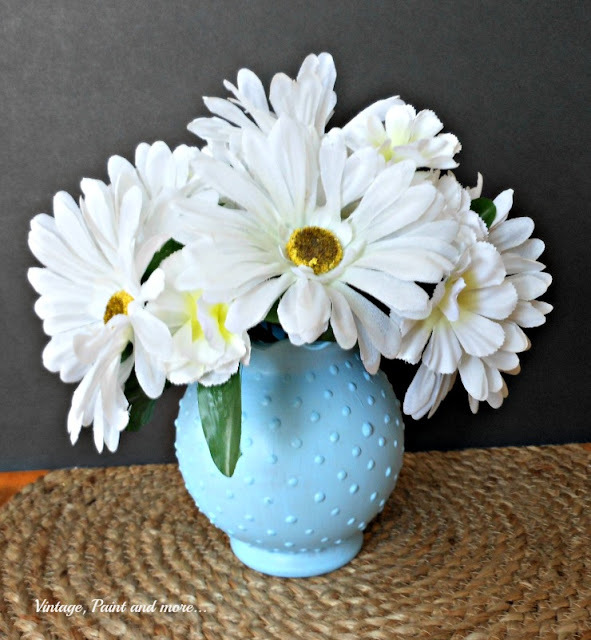 Popping by to let you know that we will be featuring your adorable vase and tutorial tomorrow night at What to do Weekends! We both loved it! Congrats! I hope we see you there!